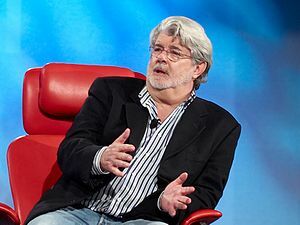 If you are like me you were probably plunged into the same bottomless black pit of intestines-extracted-through-the-nose despair at the recent announcement that George Lucas is going to be releasing the Star Wars trilogy (and three other marginally related movies) in 3D. This is disturbing on a number of levels. It is, first of all, further evidence that there is nothing Lucas will not do to wring the last shekel out of the Star Wars franchise. In addition, he is still laboring under the delusion that there are more than three Star Wars movies. Therefore the 3D(e)ification of the Star Wars franchise will begin with The Phantom Menace (which, by the way, I am going to copyright as the title for Lucas’s biography). Releasing that movie in the first place was a bad idea. Re-releasing it in any form is simply a terrible idea. A turd in 3D is still a turd, only now it is disturbingly lifelike and sitting much too close to your face. The aspect of this I find most distressing, however, is that it proves that even someone as apparently savvy about movie history as Lucas really doesn’t know jack about movie history. When it comes to the potential of 3D for movies and electronic games–and it is a technology that I believe has great potential in both these areas–this is very bad news. It indicates, in fact, that most people have missed the fundamental lesson of the juggernaut that kicked all of this off, James Cameron’s Avatar. The first is for the History Channel’s presentation of World War II in HD — the ads have been playing for a while, and frequently the week of Nov. 2nd and 9th. The ad opens with a game interface — what looks like a first-person shooter with digital target sights and visible tracers — overlaying real WWII footage. Quite an interesting look if one can get over the disturbing nature of it (when the digital shells hit the submarine, it’s a real, filmed explosion). The words appear, then, “This was no game.” Of course not. But the marketers chose explicitly to make it look that way and then advertise WWII in HD for the first time — a ludic, if not game-like, enticement. The second advertisement is for the Air Force, depicting typical fantasy/scifi-like environments and then making the claim that it’s not science fiction (but real battle, a real profession). Not only is there yet another videogaming-violence link in mainstream media, but one used specifically, it seems to me, to garner interest (or curiosity) in a WWII documentary or actual Air Force service. At a conference this past weekend, I was asked after my presentation whether or not I have studied games’ representation in non-gaming spaces (television and film, specifically); I haven’t. Well, the time, it seems, has come (the walrus said) . . .